Grant Millington: "Wigan at home will be quite a good encounter." GRANT Millington expects a big challenge from Wigan Warriors in Sunday’s Betfred Super League match at the Mend-A-Hose Jungle. 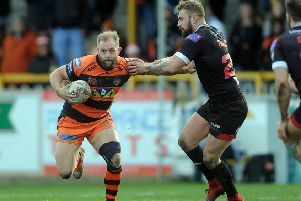 The 31-year-old Australian forward, now in his seventh season at Castleford, was pleased with last Sunday’s win against Salford but believes there is plenty more to come from the Tigers. “There’s plenty of improvement for us obviously, but we just have to keep plugging away and working hard and we’ve got another tough test this weekend. Wigan at home will be quite a good encounter I think,” he said. Millington is reasonably satisfied with his own form this season. “I’m getting there,” he added. “There’s a few little things. If you ask any player everyone always wants to improve. I am doing some things well and other things not so well. He felt Castleford’s excellent start was a key factor in the 22-8 victory against Salford. “We wanted to start well. That’s always an aim of ours. We have been a bit scratchy at doing that, but I think we achieved that,” he said. “Coming in at half-time 20-0 up is obviously a great start, but it was a little scrappy in the second half. “We didn’t get to our points that we usually do and we were a little bit off, but we came away with a win. Millington was sin-binned midway through the second-half last Sunday after an incident involving Salford’s Logan Tomkins. “I think the last time I was sin-binned was 2012, my first season here,” he added. “It doesn’t happen to me often, but it’s all part of the game. “Tomkins and I had a little bit of a scrap, nothing really serious - no punches or anything and we shook hands after the game. Millington was impressed with fellow forward James Green’s performance against the Red Devils. “He’s a handful. He’s so tall and he’s built like a snake, he sort of slides through tackles,” he said, describing the former Leigh prop.